Police were called to the home of producer and TV host Don Cornelius early this morning after gunshots were heard. Cornelius was found unconscious and was rushed to a hospital, where he was pronounced dead. 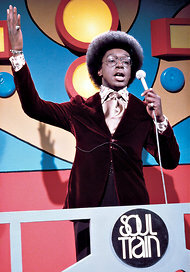 Cornelius was best known for his television show Soul Train, which aired from 1970 to 2006. Cornelius hosted the show from its beginning until 1993. “Soul Train” was one of the longest-running syndicated shows in television history and played a critical role in spreading the music of black America to the world, offering wide exposure to musicians such as James Brown, Aretha Franklin and Michael Jackson in the 1970s and 1980s. Mr. Cornelius, a former disc jockey, created the show in 1970 in Chicago on WCIU-TV and served as its writer, producer and host. Quickly becoming a success, the show was broadcast nationally in 1971, beginning its 35-year run. Besides the performers, the program showcased young dancers who would strut their stuff, laying the groundwork for countless dance programs , including current hits like Fox’s “So You Think You Can Dance?” and MTV’s “America’s Best Dance Crew.” “We had a show that kids gravitated to,” Mr. Cornelius said. Cornelius’ death is being investigated as a possible suicide. He was 75.